Conduction exchange pathways of heat exchange are shown in Figure 2.6). Various fixed properties may ensure that body temperatures are higher (or lower) than the ambient temperatures. For example, the reflective, shiny or silvery leaves of many desert plants reflect radiation that might otherwise heat the leaves. Organisms that can move have further control over their body temperature because they can seek out warmer or cooler environments, as when a lizard chooses to warm itself by basking on a hot sunlit rock or escapes from the heat by finding shade. Amongst insects there are examples of body temperatures raised by controlled muscular work, as when bumblebees raise their body temperature by shivering their flight muscles. Social insects such as bees and termites may combine to control the temperature of their colonies and regulate them with remarkable thermostatic precision. Even some plants (e.g. Philodendron) use metabolic heat to maintain a relatively constant temperature in their flowers; and, of course, birds and mammals use metabolic heat almost all of the time to maintain an almost perfectly constant body temperature. An important distinction, therefore, is between endotherms that regulate their temperature by the production of heat within their own bodies, and ectotherms that rely on external sources of heat. But this distinction is not entirely clear cut. As we have noted, apart from birds and mammals, there are also other taxa that use heat generated in their own bodies to regulate body temperature, but only for limited periods; and there are some birds and mammals that relax or suspend their endothermic abilities at the most extreme temperatures. In particular, many endothermic animals escape from some of the costs of endothermy by hibernating during the coldest seasons: at these times they behave almost like ectotherms. 35 and 40°C, and they therefore tend to lose heat in most environments; but this loss is moderated by insulation in the form of fur, feathers and fat, and by controlling blood flow near the skin surface. When it is necessary to increase the rate of heat loss, this too can be achieved by the control of surface blood flow and by a number of other mechanisms shared with ectotherms like panting and the simple choice of an appropriate habitat. Together, all these mechanisms and properties give endotherms a powerful (but not perfect) capability for regulating their body temperature, and the benefit they obtain from this is a constancy of near-optimal performance. But the price they pay is a large expenditure of energy (Figure 2.7), and thus a correspondingly large requirement for food to provide that energy. Over a certain temperature range (the thermoneutral zone) an endotherm consumes energy at a basal rate. But at environmental temperatures further and further above or below that zone, the endotherm consumes more and more energy in maintaining a constant body temperature. Even in the thermoneutral zone, though, an endotherm typically consumes energy many times more rapidly than an ectotherm of comparable size. seasons. 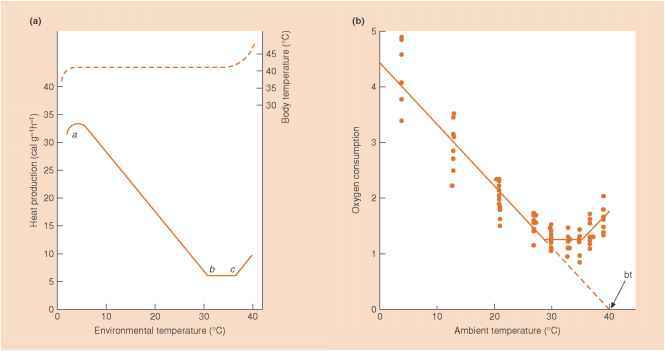 Temperatures only a few degrees higher than the metabolic optimum are liable to be lethal to endotherms as well as ectotherms (see Section 2.3.6). It is tempting to think of ectotherms as 'primitive' and endotherms as having gained 'advanced' control over their environment, but it is difficult to justify this view. Most environments on earth are inhabited by mixed communities of endothermic and ectothermic animals. This includes some of the hottest - e.g. desert rodents and lizards - and some of the coldest - penguins and whales together with fish and krill at the edge of the Antarctic ice sheet. Rather, the contrast, crudely, is between the high cost-high benefit strategy of endotherms and the low cost-low benefit strategy of ectotherms. But their coexistence tells us that both strategies, in their own ways, can 'work'. Why would endotherms increase oxygen consumption? Are plants ectotherms or endotherms? Are worms endotherms or ectotherms? Is a bumble bee an endotherm or ectotherm? Is a bivalve an endotherm or ectotherm? Is coral endotherm or ectotherm? Are whales ectotherms or endotherms? 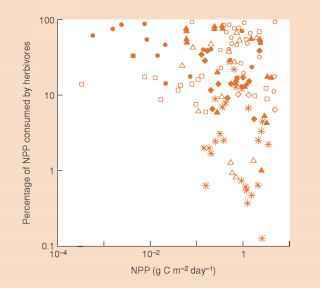 Does temperature affect species richness in ectotherms? Are sponges ectotherm or an endotherm? Is an eastern chipmunk ectothermic? Are mammals ectotherms or endotherms? Are ectotherms or endotherms more susteptible to pesticides? Are krill ectotherms or endotherms? Are sponges ectothermic or endothermic? Is a bumble bee an endotherm or an exotherm? Are eastern chipmunks endotherms, ectotherms, or poikilothermic? Is a whale endotherms ectotherms? Are penguins endotherms or ectotherms? Are bivalve endotherms or ectotherms? Are fleas ectothermic or endothermic? Are segmented worms endotherms or ectotherms? Can extotherms have a thermoneutral zone?